Now available: new M5 clothing. Discreet, yet bright in traffic. Available are Bermuda's, shirts with 3/4 sleeve and bike jacks long sleeve. Our M5 teamshirts are now also available in this colour setting. 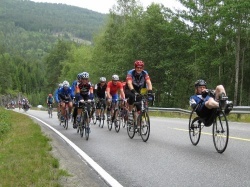 During the upcoming Paris-Brest-Paris race from August 20 to 24 2007 a large number of people will participate on an M5 recumbent. 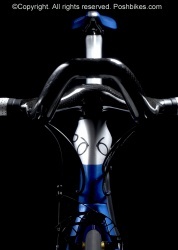 During this non-stop monster trip quite a lot of riders will use our latest model, the M5 Carbon High Racer. Participants from our region (Zeeland, the south west of the Netherlands) are Mr. J. Bouman from Goes (age 65 plus) with an M5 City Cruiser/Tail Bag, Perry Stoel from Grijpskerke with an M5 Carbon High Racer/Tail Fairing and Rob Stricker from Zoutelande with an M5 CrMo Shock Proof 559 and Tijmen Hoeven, at the moment living in Zaandam, with an M5 Carbon High Racer/Tail Bag combination. Also worth mentioning is the Australian participant Andrew Heard, who already was preparing for this PBP for three years. During his holiday in England M5 Titanium Shock Proof 451 was stolen ... To compensate his loss a little, we decided to offer him an identical replacement to enable him to participate after all. Other participants are also supported with things like fast wheels and/or Tailfairing to reach a better placement. Stefan Vanlerberghe from Belgium did participate for M5 in the Viking Tour 2007 in Norway and did also very good going up the mountains. During the Vikingtour not the whole trip is timed, but only certain parts of it. Unfortunately the parts which are most suitable for recumbents weren't... Nevertheless Stefan managed to get the best out of it, also during steep climbing. Recent test data confirm that the M5 cranksets are of outstanding quality. A professional racer is able to produce 800 Newton over a period of ten seconds. 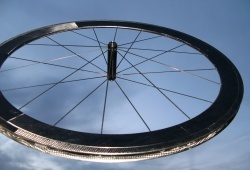 The cranks have been tested during 6,700,000 cycles with a power of 800 Newton, increased to a full 5,400 Newton! The cranks endured this extreme test superb! 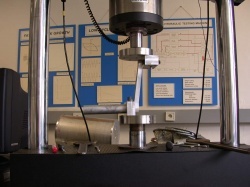 Two measurements have been implemented with stretch strips. The positions of them can be seen on the small pictures at the bottom. The T38 and T50 version now have an embedded reinforcement, made from an aluminium extrusion profile. 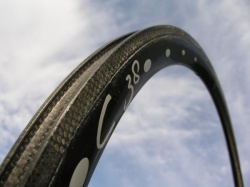 Every spoke has an extra support by an elliptical aluminium bowl shape, entirely embedded in the carbon rim. 4.5 grammes, that's the weight of the latest version of our brake shoe casings. Established by lowering the casings. New full carbon seat mounting for M5 Carbon High Racer ready! To offer a maximum choice in available seat angles, we now have a third type carbon seat support for the Carbon High Racer. 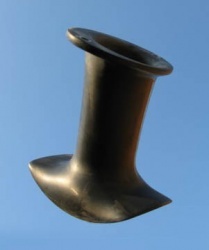 This new ultra light weight carbon component has been manufactured with a fourfold steel mould. And we didn't even subscribe for participation! Nicely visible are the distinctive uni directional carbon fibres at the sides and the carbon fabric for the re-enforced brake and spoke hole areas.